PoPville » Short Week – Thurs. Question of the Day – What’s Your Favorite Vacant Property in DC? Short Week – Thurs. Question of the Day – What’s Your Favorite Vacant Property in DC? I have three that jump in my head right away. 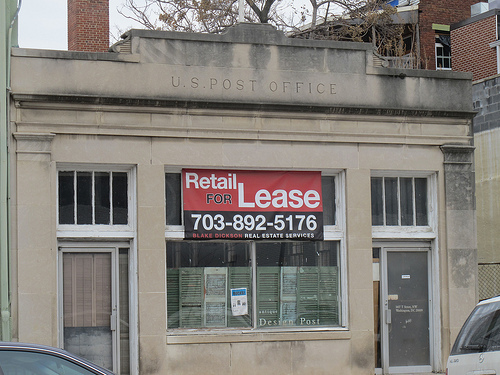 I’ve always loved the old post office (pictured above) on T St, NW just west of 14th that has been for lease for ages. I also love the old Fire House on North Capitol in Bloomingdale and I love the Uline Arena (home of the first Beatles concert in the US) in NoMa. Another good challenger is the old theater in Adams Morgan on Columbia Rd, next to the old CVS. And of course there is the classic Wonderbread Factory in Shaw. What’s your favorite/which would you most like to see get fixed up? The crazy thing is that sometimes I have people emailing me about these properties and want to start businesses/restaurants there, so in my mind something is completely fracked up that the buildings still sit vacant/dilapidated. Now I’m no economist but if we have people that want to open up in these spaces – they should not be sitting vacant this long! Somehow, some part of this system is seriously fracked.